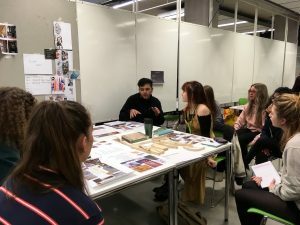 Tuesday 20th March was the ‘Big Crit’ day for students involved in the Endangered Crafts Unit X project at Manchester School of Art, which has been inspired by the HCA’s Red List. First and second year students on the Textiles in Practice (TIP) and Three Dimensional Design (3DD) programmes, as well as students joining the project from fine art, film making and interactive arts came together to share their findings so far. Students have had inspiring input from Steve Dixon, professor of Craft, Alice Kettle, professor of Textiles Arts, Martyn Evans, professor of Design, as well as talks and workshops by designers Silo Studio and artists Hwa Young Jung, Brendan Dawes, Zoe Robertson and Ismini Samanidou. It’s been a fruitful three weeks with much discussion and debate around what and why a craft is on the ‘Red’ list and how the students want to develop their ideas using the research they have generated so far to inform the next stage of the project. The Big Crit saw students proposing ideas and presenting prototypes and test pieces to demonstrate their thinking. A wide variety of work has been produced so far – from marbled paper to samurai sword making at first year level, and from proposing new applications for endangered practices to inventing new ways of thinking about the production of craft products at second year level. A very positive and interesting day for all, and a great start to the project. Students are looking forward to the start of the summer term where groups will materialise their thinking through making in preparation for the Unit X Festival and opening night at the Manchester Craft and Design Centre on Wednesday 9 May at 5:30pm.